Dr. Judy analyzed the data from 5000 healthy adult volunteers. The data showed that, through the course of their lives, approximately 13% (green) of the volunteers had low plasma Coenzyme Q10 status, nearly 75% (blue) had medium plasma Coenzyme Q10 status, and only 12% (red) had high Coenzyme Q10 status. Conclusion: fully 88% of healthy adults, starting in their 30s and 40s, could benefit from a daily Coenzyme Q10 supplement. As with so many other things in life, “normal” as in normal Coenzyme Q10 status is a topic about which reasonable people can reasonably disagree. The range for normal Coenzyme Q10 status, measured in plasma or in serum, is relatively wide and can vary according to a number of factors: age, diet, fitness level, gender, heredity, and nature of work activity. 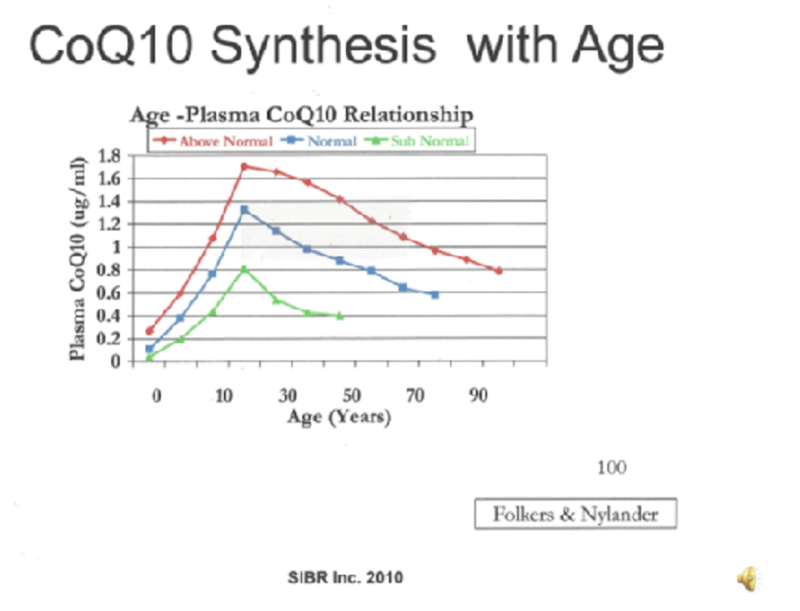 As far as we know, the distribution of human Coenzyme Q10 status in plasma and serum resembles more or less a normal bell-shaped curve with 50 percent of adults having below average Coenzyme Q10 status and approximately 16 percent of adults having very low Coenzyme Q10 status. Only about 16 percent of adults at the top end of the curve can be said to have unusually high Coenzyme Q10 status. Bhagavan and Chopra (2006) estimated that the normal range for plasma Coenzyme Q10 was from 0.35 to 1.65 micrograms per milliliter, which can also be expressed as milligrams per liter. That is a wide range for normalcy, and it must surely reflect the inclusion of data from very heterogeneous samples. The lower limit of the range suggests that the data must include individuals on diets that are very low in Coenzyme Q10, e.g. Indians on the subcontinent. Molyneux (2008) said that the well-established normal range for plasma Coenzyme Q10 status was between 0.43 and 1.47 micrograms per milliliter. Her normal range was somewhat narrower than the range proposed by Bhagavan and Chopra, but it was still quite wide, reflecting the considerable extent of diversity in human beings. To reiterate: the diversity in plasma Coenzyme Q10 status can be associated with biochemical or genetic factors or with such factors as age, body mass, diet, disease, ethnic origin, and exercise level. Sharma, Felker and colleagues (2016) in a state-of-the-art review of the literature about Coenzyme Q10 and heart failure drew attention to the solid correlation between abnormal plasma Coenzyme Q10 levels and the diagnosis of chronic heart failure. Folkers and Mortensen (1985) took heart muscle tissue biopsies from 43 patients with heart failure classed in all four New York Heart Association (NYHA) classes. They found that patients in the NYHA class IV had significantly lower heart tissue Coenzyme Q10 levels than patients in NYHA class I. Furthermore, patients in NYHA classes III and IV had a significantly lower heart tissue Coenzyme Q10 levels than patients in NYHA classes I and II. When the heart failure patients in the Folkers study were treated with a Coenzyme Q10 supplement for 2 to 8 months, the increases in the Coenzyme Q10 levels in the patients’ heart tissue biopsies ranged from 20% to 85%. Dr. Folkers et al concluded that their data revealed a heart muscle deficiency of CoenzymeQ10 that was seen to be higher in patients with greater disease severity. The heart muscle deficiency could be safely and effectively reduced by adjuvant treatment with Coenzyme Q10 supplements. Dr. William Judy, director of the SIBR Research Institute, analyzed the raw data from 5000 volunteers and found that it showed a need for daily Coenzyme Q10 supplementation in nearly 88% of adults. Dr. William Judy, SIBR Research, has provided the graph shown above in this article. The curves in the graph are based on longevity data from more than 5000 normal volunteers that were collected and maintained by Dr. Karl Folkers and Dr. Magnus Nylander. Dr. Judy took the data and separated the data into three sub-sets: a low Coenzyme Q10 status group, a medium Coenzyme Q10 status group, and a high Coenzyme Q10 status group. The longevity data show that the volunteers in the group with the low Coenzyme Q10 status (about 13% of the total) were in questionable health, showed clear signs of early ageing, and died before they reached the expected longevity age for their gender. The volunteers in the normal Coenzyme Q10 status group (about 75% of the total) were in generally good health but began to age more rapidly in their late 40’s and generally died in their 70’s and 80’s. The middle of the plasma Coenzyme Q10 status curve in this study turns out to include a bit more than the expected 68%; that is most likely because of the wide range of “normal” Coenzyme Q10 status. The volunteers in the high Coenzyme Q10 status group (about 12% of the total) had good health throughout their lives, were seldom or never sick, had very few hospitalizations, and generally lived into their 90’s. 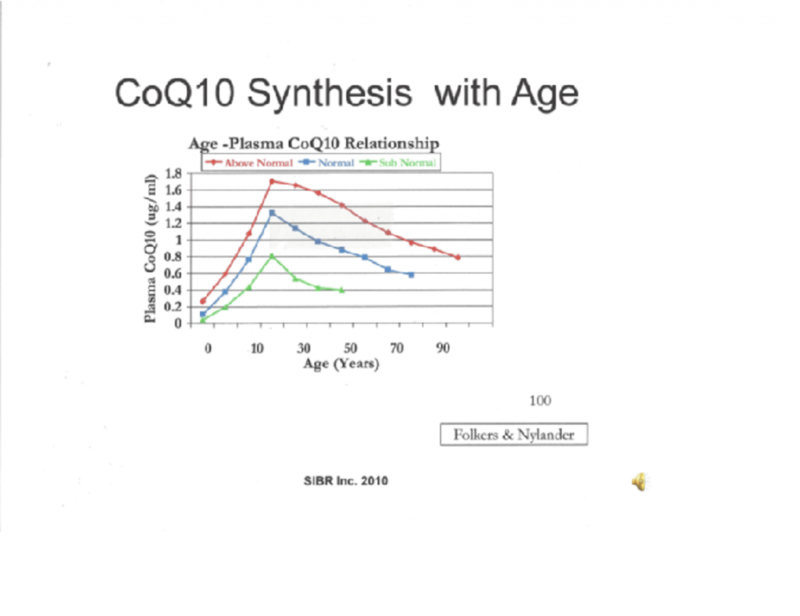 Based on Dr. Judy’s analysis, nearly 88 percent of “normal” healthy adults need a daily Coenzyme Q10 supplement to delay the onset of ageing and to prevent the development of age-related degenerative diseases. Judy, W. V. (2016). Personal communication. 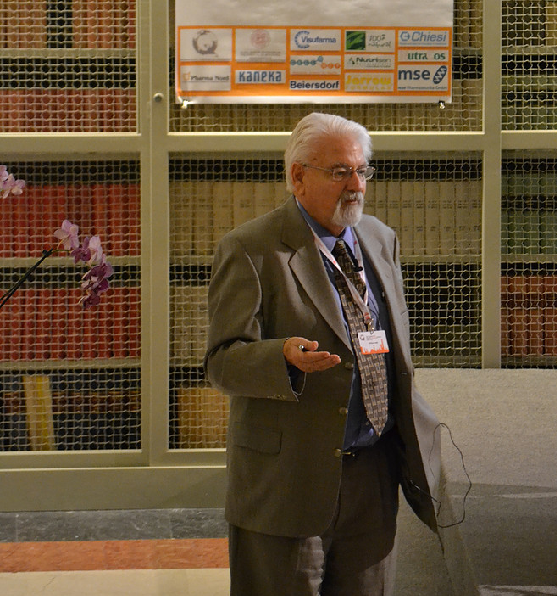 Sharma, A., Fonarow, G. C., Butler, J., Ezekowitz, J. A., & Felker, G. M. (2016). Coenzyme Q10 and Heart Failure: A State-of-the-Art Review. Circulation. Heart Failure, 9(4), e002639.